Photograph of Serviceman in WWII from Box Elder County. LeGrande W. Colby. 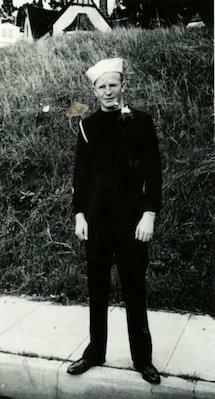 Man in uniform stands in front of shrubs. Written on front: "Surprise!" Written on back: "LeGrande (Grandy) W. Colby had is training at Catalina Island and Long Beach, Calif. He is in the Merchant Marine. He has been in the following ports, Honolulu, Samoa, also some French islands and Sidney, and Brisbane Australia."